For the past several days there is increased interest in chess politics, with one of the most visited articles on Chessdom being the Russian Chess Federation election details. Our email is now full of comments by chess fans, politicians and analysts about the elections, mainly focusing on the participation of Kirsan Ilymzhinov. Practically comments relate to the interesting fact that the FIDE Executive board voted against the participation in FIDE elections of Mr. Kirsan Ilyumzhinov, but now he is a Candidate in another election – the one of the Russian Chess Federation. 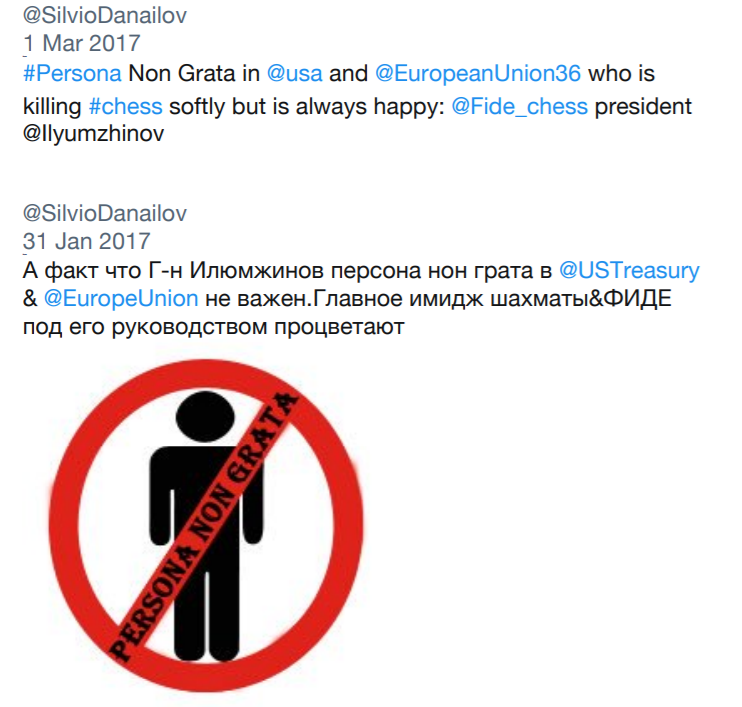 What’s more, he seems to receive bizarre support – in a strange and unexpected twist Silvio Danailov, the man investigated for corruption of unfathomable proportions (see here, here, and here), and an ardent critic of Ilyumzhinov and Russian chess… is now their ardent supporter! Hence, the chess politics is in full swing once again with elections coming not only in Russia, but soon in FIDE. So far Chessdom has covered every important election with impartial reporting and sticking only to the dry facts, and we will continue this tradition. The political season is officially open! Makropoulos speaks here about the problems that FIDE faced with its bank accounts in Switzerland and explains that the situation can be worse if Ilyumzhinov is re-elected as President and legal representative of FIDE. The Presidential Board in Athens was turbulent. Ilyumzhinov tried to solve his personal issues with Agon within the FIDE Presidential Board. Makropoulos continues with the second meeting in Athens in April, where Ilyumzhinov himself confirmed the previous decisions of the Presidential Board. “I can say that there are worse than that. There are personal threats; personal threats against people; personal threats against Geoffrey Borg that his visa would be cancelled in Russia; his residence in Dubai would be canceled because Kirsan has high relations there. And, of course, when Geoffrey speaks with Kirsan, and says “ OK, Kirsan, but I cannot understand why you’re going to this level’’. Kirsan says, “No, it’s not me. It’s Russia behind me. Putin.” In many things, ugly things, Russia is behind, it’s not Kirsan who is pushing this. And of course, the Russian President. And I can say that this is completely wrong. For me, this is the worst. And Andrey Filatov, I’m telling you that this is very bad because this is very bad for your country, this is very bad for your federation, this is very bad for your president. Because I personally believe that Russia has nothing to do with these ugly things, and President Putin has nothing to do with these ugly things. And really I’m expecting from you to stop this kind of propaganda. And if you cannot alone, we are here to help you. And if you don’t need our help and you don’t want, we will do it for you. It is not possible that we are creating here a political fight against Americans, against Russians, against presidents, Obama, Trump, Putin. I’m sure they have nothing to do with our family and our federation. “Chess in Schools” project in Russia? There are letters and “contracts” with Russian regions and entities that imply that FIDE asks for money for chess in school programs. But none of the projects brought any income to FIDE or Russian Chess Federation. Where did the money go? Makropoulos gives numbers of the FIDE budget showing that the money is spent by Ilyumzhinov and Berik Balgabaev. Makropoulos speaks openly about his health problem and the truth about his treatment. 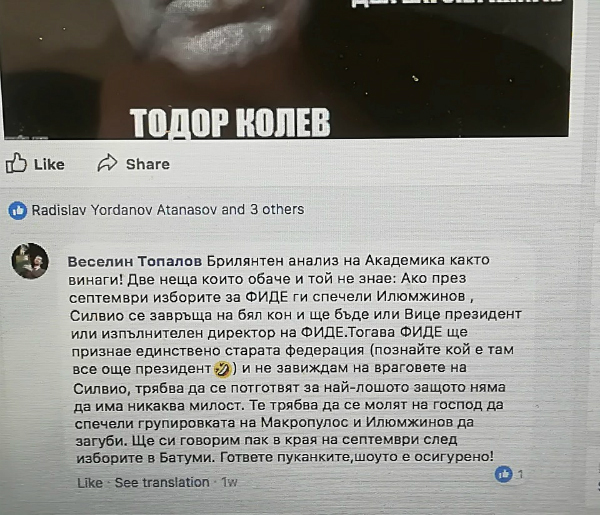 Makropoulos asks the lies and threat to be stopped adding that the Ilyumzhinov followers are mainly to be blamed for these. The words of Makropoulos come from the official minutes of FIDE. 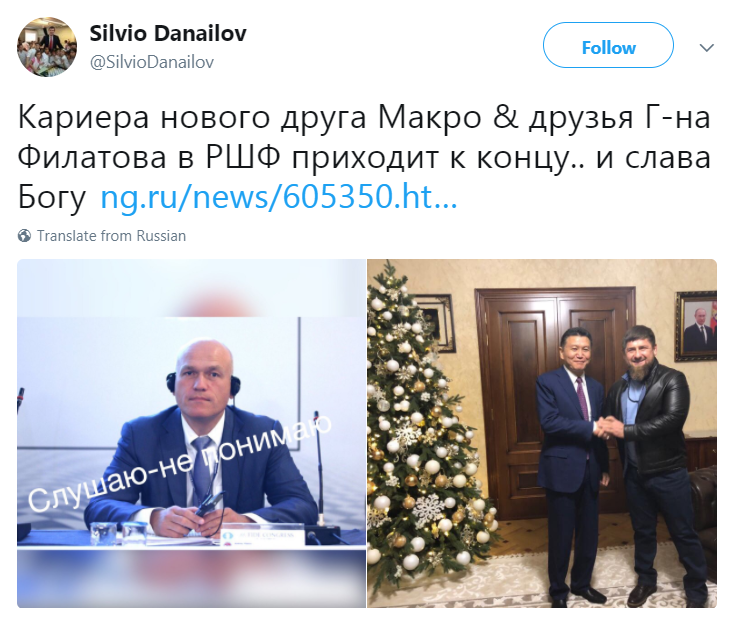 It is strange that neither Ilyumzhinov nor someone from his supporters answered any of the points raised by Makropoulos. We hope to receive details and the full picture soon. Topalov’s words are later confirmed by the attitude of Silvio Danailov. In the midst of a crisis where ECU filed a criminal complaint against him in Slovenia,he was attacking Kirsan Ilyumzhinov. Now there are signs of clear support. Here is a “before” and “after” tweet of Danailov’s attitude towards Ilyumzhinov. The political season is open and Chessdom will follow it on a daily basis. Do you have your popcorn ready?